A US based construction material production company has developed a rapid and inexpensive method of tunnel building. The Zipper Truck has a unique barrel frame which is wider at the front than at the back and is equipped with heavy duty rollers. Concrete lego-like blocks are positioned to form the walls of the tunnel around the truck. 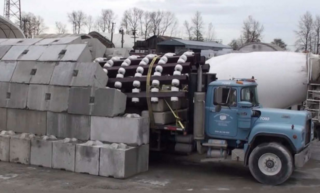 The roof segments are then positioned on top of the trucks barrel rollers and when in place the truck can move forward as the bricks slide and lock into position, looking very much like a huge concrete zipper. The lego-like concrete blocks are pre-made and fit together neatly without mortar, and with no need for cure time the tunnel can be used immediately. Clever solutions that save clients time and money is what we at BE Collective are all about! Check out this sweet video to see just how strong the zipper-tunnels are and how fast they can be built.